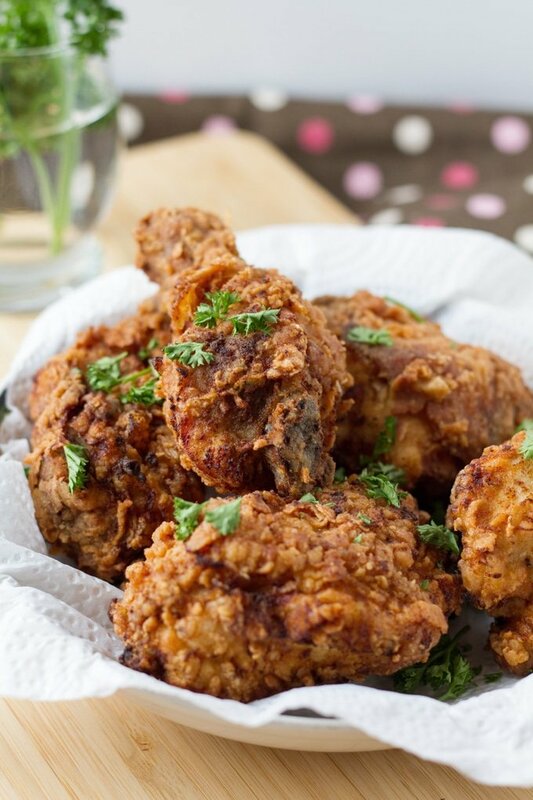 You really can make Classic Deep Fried Chicken like Gramma used to make. Check out our tips for making it without a ton of prep work. No dip in this egg batter then dip in that flour mixture mess here! There’s always a bit of a mess when it comes to deep frying chicken but we’re making homemade fried chicken as simple as possible. 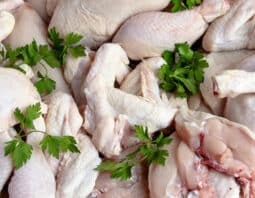 You can totally buy a whole chicken and cut it up into 10 pieces – 2 wings, 2 thighs, 2 legs, and each breast gets cut in half for a total of 4 breast pieces. Or, you can save yourself the time and hassle and buy 4 pounds of whatever cut of chicken you want. Like all chicken drumsticks. Or thighs. Or breasts. 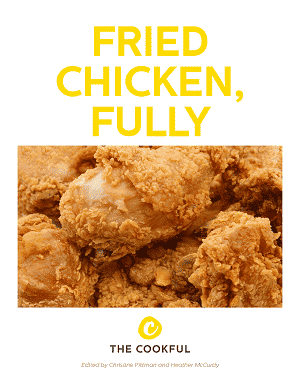 Yup, that means you can make a whole batch of your favorite pieces of fried chicken. You’re the one making it so make it the way you like it best! You’ll start by marinating the chicken pieces in buttermilk and hot sauce for a minimum of 3 hours (or better, marinate them overnight or all day while you’re at work). Once they’ve been marinated you’ll coat each piece in delicious seasoning with spices like paprika, garlic powder and nutmeg. 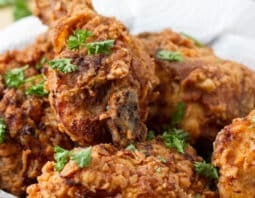 Instead of having you dip chicken pieces in flour then egg, we’ve put the flour and spices in a bag and you just add the chicken to that and shake. 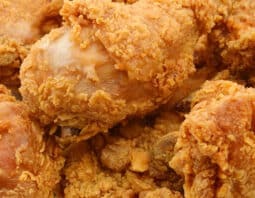 Just like shake ‘n bake but this is flour instead of crumbs, so you get that crispy classic coating that you crave daily. You know you do. Mmmmm. 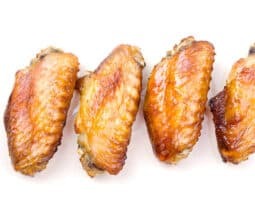 I always recommend using a thermometer (like this one) when you deep fry chicken so you know the oil is the right temperature (350°F) to cook the inside of the chicken without burning the outside crust. Then, to know that the chicken is cooked through, use a different kind of thermometer, an instant-read thermometer. You’ll be golden! Ha! In a large glass container mix together buttermilk, hot sauce and 1/2 teaspoon of salt. Place chicken pieces into the buttermilk and cover. 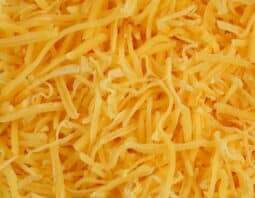 Refrigerate and leave it for at least 3 hours or overnight. Before frying, in a zip top bag, mix flour with remaining 1 teaspoon of salt, sweet paprika, garlic powder, black pepper and nutmeg. Close and shake it well to mix. Remove chicken pieces from buttermilk, letting the excess buttermilk drip off. Place 2 pieces in the bag and shake it well, until the chicken is thoroughly coated. 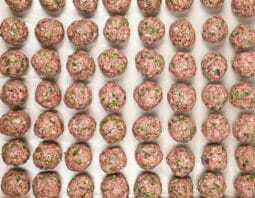 Remove and place on the wire rack. Repeat for remaining pieces of chicken. In a medium pan heat oil until it reaches 350°F. Place chicken in the oil and fry for about 20-25 minutes, turning halfway through. Once the chicken is dropped into the oil the temperature will lower to 300°F – 325°F. Be careful not to burn the crust. Lower the heat if the exterior of the chicken seems to be cooking faster than the interior. Keep the stove on low-medium heat. Chicken is done when internal temperature is 165°F or higher on an instant-read thermometer. Ilona blogs at Ilona’s Passion where she focuses on sweet and savory party recipes. She believes in making recipes from scratch and not very sweet desserts. She likes to experiment with flavors while cooking in her Canadian kitchen. She has lived in three countries and loves to explore the world with her two boys and a husband. While not cooking or traveling she designs printable invitations and party decorations.